The main entrance to the temple of Luxor is by the great Pylon of Ramses II (Plan 2 P.i). In front of it are six enormous statues of Ramses II, two seated and four standing. Were these statues not carved from solid granite one might imagine them to have been cast from a pair of moulds, so similar are their solid legs firmly implanted feet, square shoulders, clearcut features and eyes looking forward through all eternity. 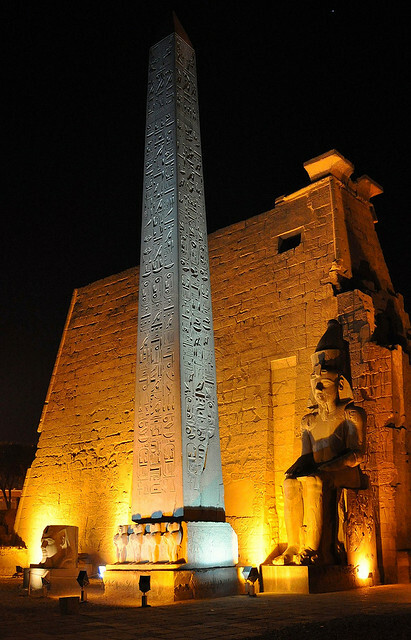 In front of the seated figures were two pink granite obelisks. The one in position, now reinforced and repaired, has its base adorned with four praying apes on one side, and the inscriptions name Ramses II himself as the builder of this magnificent temple erected to honour Amon, blithely overlooking the fact that he was responsible only for adding to the entrance section of a temple that had stood on site for over seven hundred years. The other obelisk now stands in Paris. The outer walls of the pylon are embellished with records of Ramses II’s military campaigns, particularly against the Hittites of Syria in the fifth year of his reign. Ramses II was always anxious for his personal bravery to be recorded and his sculptors lost no time in pandering to his vanity. On the western tower (a) one can still make out life at the Egyptian camp (to the right) and the enthroned Pharaoh holding council (to the left). In the centre is the fortified camp with shielded soldiers and the Pharaoh himself dashing with his chariot into the fray. The eastern tower (b) depicts a ferocious battle with Ramses II, still in his chariot, hurling arrows at the surrounding enemy. Dead and wounded lie beneath his feet and the enemy flee in confusion to the fortress of Kadesh from whence fresh troops appear. Kadesh itself is surrounded with battlements and the defending Hittite forces. To the extreme left, somewhat remote from the heat of the battle, the prince of the Hittites may be seen surrounded by his guards and supposedly in fear of the enemy.